SPIRAL GINGER SLIDESHOW: Some of my friends pick on me (in a kind-hearted way) because I have a good number of plant related slideshows. "Andy has a slideshow for that" is what some of you sukkas say when we talk about many different plants. 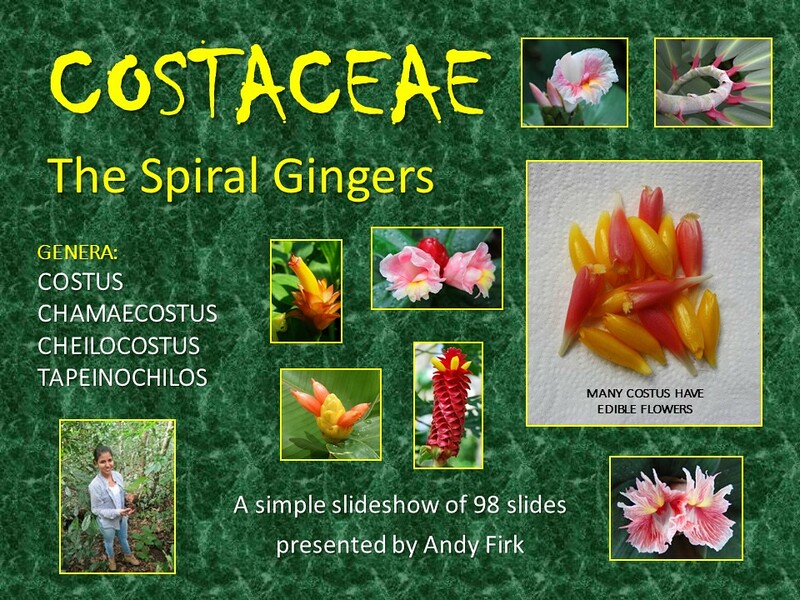 Well, I am happy to let you know that I now have yet another slideshow... this one details the COSTACEAE FAMILY, The Spiral Gingers. I highlight easy to grow species for Florida with edible flowers. Thanks to Costus wizards Richard O'Brian, David Skinner, Colton Collins, and Timothy Chapman for cultivating and selling these beauties through their nurseries and sharing such clear and concise information regarding them. By the way, Costaceae (the costus / spiral ginger family) is separate from Zingiberaceae (the ginger family). Both fall under the order Zingiberales.